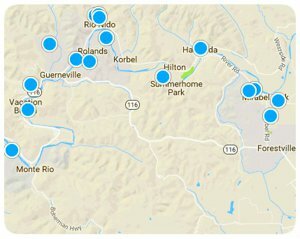 Just west of Guerneville nestled in the Redwoods along the Russian River is a quaint little vacation town called Monte Rio. It has been aptly named by the locals the "Vacation Wonderland." It has been a popular vacation spot for generations drawing people all over. The Monte Rio Real Estate market consists primarily of Vacation Rentals and local Cabins for sale. 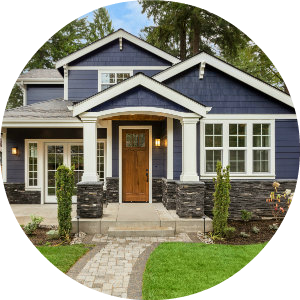 Homes for sale in Monte Rio Range in price as each home is as eclectic as the people living in them. Monte Rio is a small community of people who are very welcoming and accepting. It is known for it's natural beauty and inclination towards fun! This town is known for many different things including the Bohemian Grove, the Rio Theater, their annual Monte Rio Variety Show, and the Northwood Golf Course. The community itself is very welcoming and the River is beautiful year round. One of the most popular events on the Russian River takes place in Monte Rio in the summer at the Monte Rio Amphitheater where locals and tourists alike gather together for an amazing night of music, comedy, and fun. The event costs $25 per person and the proceeds raise funds for local charities. The event is known for featuring artists that go on to become famous. On the sandy shores of the Russian River the local community joins with these future stars to carry on this tradition with acts from Country to Jazz, Rock to Classical and everything in between. The Bohemian Grove is a place of mystery and intrigue that has permeated the Russian River area for generations. 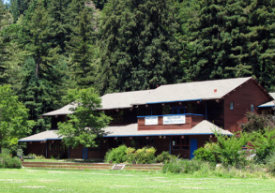 The 2,700 acre campground is located in Monte Rio and is owned by a private men's club known as the Bohemian Club that is based in San Francisco. Only the worlds richest and most powerful men are invited to stay at the Bohemian Grove for a 2-3 week encampment during the summertime. Although they may invite their spouses, family and friends all females and minors are required to vacate the premises by 10pm at the latest. 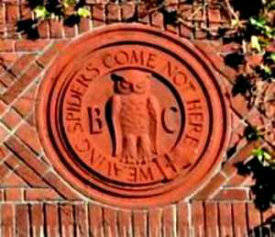 The Bohemian Grove mascot is the Owl symbolizing knowledge and their motto is "Weaving Spiders Come Not Here." This is supposed to mean that all business dealings and politics are to be left at the door and are not to be discussed within the campground however there is much speculation in the area about whether or not their motto is honored. In September 1942 a secret meeting was said to have taken place at the Bohemian Grove that discussed the Manhattan Project and subsequently led to the atomic bomb. Since the early 1920's an owl shrine has stood at the front of the lake on the property guarding the secrets that lie within. Among the rolling hills and towering redwoods of Monte Rio is Northwood Golf Course. This is a place where people can go to relax and enjoy a beautiful day in nature while getting some exercise. Many people will take the course once, get some lunch at the cafe, and then hit the course one more time before dinner. In 1949 Sid Bartlett purchased a surplus Quonset hut from the US Navy and converted it into a Theater. After years of transitioning from one person to another and even being foreclosed on at one point the property came to rest with the Schafferts. They were upstanding Monte Rio citizens that quickly came face to face with a $4,ooo fine for allowing the communities children to do odd jobs around the theater in exchange for movie tickets and snacks. The judge was swayed to reduce the fine when the parents rallied in support of the Schafferts for allowing their children to do something productive while keeping them out of trouble. The Rio Theater has an adorable little cafe with hamburgers, sandwiches, hot dogs, and ice cold drinks.The Rio Theater has since been a community landing spot where locals and tourists go to enjoy a night out on the town. Monte Rio hosts a major beach blow out every year for two days. This event known as the Big Rocky Games features food, fun and festivities as children and adults alike splash in the river, laugh out loud, and participate in the games and contests. Activities at this event include volleyball, a horseshoe tournament, inner tube races, rock skipping, a water balloon toss, an ice cream eating contest, canoe races and more! This event builds unity within the area and offers families a fun filled weekend that they will remember for years to come. 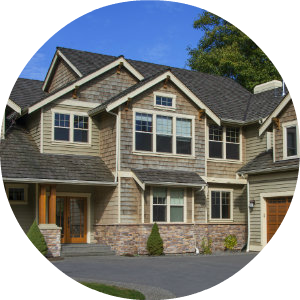 This wonderful home offers a Sunny Location Across from Highland Del Hotel. Own to live in or use for Vacation Rental. Great Opportunity. 4 bedroom plans and permit for septic approved by County. Walking distance to river. Flat and full of sunshine!Build your own dream home. Cottage with 2 bedrooms and 1 bath, large deck overlooking the hills, lots of privacy.